Sometimes, when going for a drink with friends or boyfriend/girlfriend, you may prefer to get away from loud music and crowded places just to enjoy the company in a quiet and pleasant way. Barcelona has some really nice chill out bars, we are giving you some of the best places in the city. Chill out bar decorated in Oriental style, sofas and low tables, relaxing environment to enjoy a cocktail by the the candle light. Light meal such as creps or salads are served. Milk bar is designed in a cute and elegant way, plush sofas, pillows with exotic decoration and a curious wallpaper. Altogether this bar makes you feel being at somebody’s living room or even, it makes you think about changing your own living room to look like this. Food is served almost all day and the menu changes seasonally. Brunchs served are quite famous. 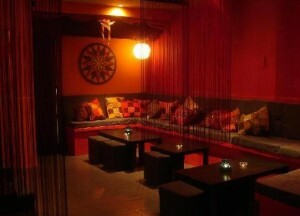 Elegant bar decorated in white, red and black colours. This bar is located inside the Hotel Meridien (one of the most relevant hotels in the city) and has large windows that allow a privileged view of Las Ramblas and the city. Extensive menu of cocktails and beers are served. Prices are not cheap. 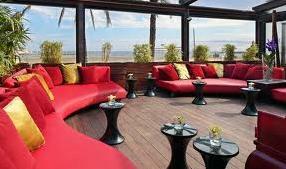 Famous and fashion Club within the nightlife of Barcelona it is located by the sea. It is a Chill out bar during the day and a music club by night. Prices are not cheap. Pleasant terrace chill out at the old town but away from all noises. 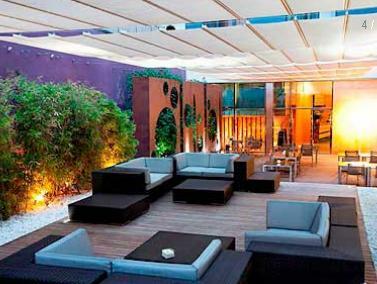 A beautiful and elegant place where to relax and enjoy a drink or a snack. 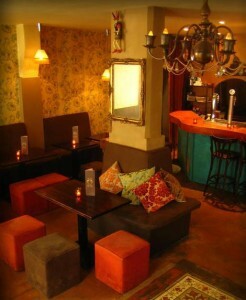 This bar is located inside the Hotel Barcelona Catedral. Prices are not cheap.